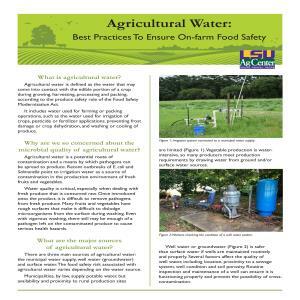 Agricultural water is defined as the water that may come into contact with the edible portion of a crop during growing, harvesting, processing and packing, according to the produce safety rule of the Food Safety Modernization Act. It includes water used for farming or packing operations, such as the water used for irrigation of crops, pesticide or fertilizer applications, preventing frost damage or crop dehydration, and washing or cooling of produce. A continuous and well organized daily, weekly or monthly environmental monitoring plan is a critical component for any food safety program. Regardless of the size or the number of personnel (even if there are just a couple of operators), every farm must have one or multiple people who are trained and in charge of monitoring the safety procedures, such as cleanliness of toilets and hand-washing stations, proper hand-washing, proper sanitizing and so forth. Those who work on farms play a key role in ensuring the safety of the produce they grow, harvest, pack and hold. Poor worker health and hygiene was identified as the potential contributing factor in the contamination of the product in many foodborne illness outbreaks. Therefore, the importance of clean hands at all phases of production, especially harvesting and packing, cannot be emphasized enough. Good agricultural harvest practices range from harvesting techniques and equipment to worker health and hygiene. Fresh produce can become contaminated with pathogens before, during and after harvest. It is important to consider all potential microbial hazards when harvesting to ensure the safety and quality of the harvested product. Taking the appropriate steps to implement good field sanitation practices will benefit the producers and consumers. Livestock manure commonly carries several harmful microorganisms or pathogens that can cause illnesses in humans, even when the carrier animal has no visible symptoms. Vegetables and fruits grown on recently manured fields can be at risk of becoming contaminated by those pathogens during the production cycle. 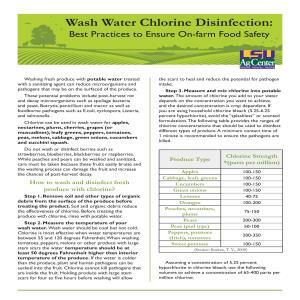 Post-harvest washing of produce may reduce surface contamination, but most commonly used disinfectants will not remove or kill all pathogens associated with the produce. Rough textured produce, such as cantaloupes or other melons, pose an even greater problem for pathogen removal via washing. Therefore, the preferred goal for growers is to prevent produce from becoming contaminated on the farm and/or in the packing shed. Pets and wild animals are potential sources of foodborne pathogens that can introduce disease-causing microorganisms from their feces on the farm. 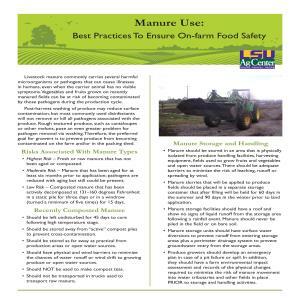 Soils become naturally contaminated with animal manure, and cross-contamination of fruit and vegetable products can occur. 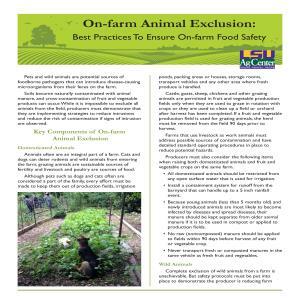 While it is impossible to exclude all animals from the field, producers must demonstrate that they are implementing strategies to reduce intrusions and reduce the risk of contamination if signs of intrusion are observed. 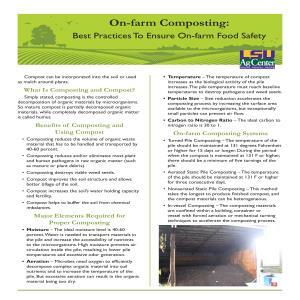 Compost can be incorporated into the soil or used as mulch around plants. Simply stated, composting is the controlled decomposition of organic materials by microorganisms. So mature compost is partially decomposed organic materials, while completely decomposed organic matter is called humus. You can customize these record keeping templates and use them to verify you are following good agricultural and handling practices. The purpose of a pest control program is to reduce the presence of pests or to exclude pets from produce processing and storage areas. Pest control can be performed by farm personnel or another company. If pest control is performed by personnel working on the farm, a farm employee must be appointed as a pest control program manager. That manager is responsible for all pest management issues. If pest control is contracted out to a pest control company, records from the paid inspector must be kept on the farm and available for inspection within 24 hours of the initial request. If you grow fruit or vegetable crops, you are going to have issues with pests (plant pathogens, insects, and weeds). Knowing all of your options is paramount to successful pest management and control. Among the options are pest prevention, nonchemical pest controls and chemical pesticides. 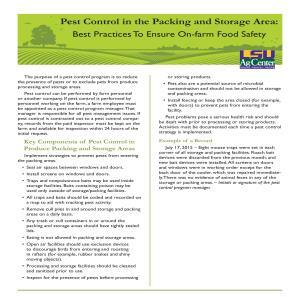 Most pest management experts agree the most effective strategy for pest control is combining several methods in an approach called Integrated Pest Management, or IPM. The goal of IPM is to prevent pest damage in the most economical way and the least possible hazards to the environment and the community. 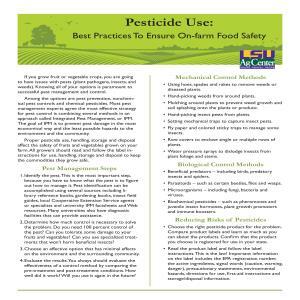 Proper pesticide use, handling, storage and disposal affect the safety of fruits and vegetables grown on your farm. All growers should read and follow the label instructions for use, handling, storage and disposal to keep the commodities they grow safe. 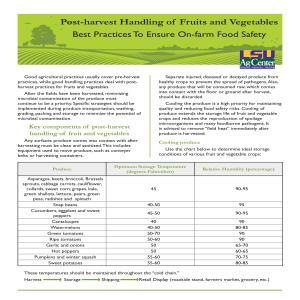 Good agricultural practices usually cover pre-harvest practices, while good handling practices deal with post-harvest practices for fruits and vegetables. After the fields have been harvested, minimizing microbial contamination of the produce must continue to be a priority. Specific strategies should be implemented during produce transportation, washing, grading, packing and storage to minimize the potential of microbial contamination. Water is used for many post-harvest activities such as rinsing produce, commodity movement, cooling, ice production, post-harvest fungicide and wax applications, cleaning, sanitizing and hand-washing. Human and plant pathogens easily can be spread through water, and a pre-harvest contamination event can be amplified by post-harvest water. All water used for post-harvest activities must be the equivalent of drinking water (must be potable water). That means no detectable E. coli should be present in a 100 milliliter sample. 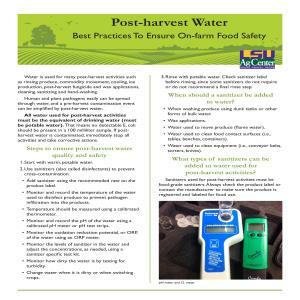 If post-harvest water is contaminated, immediately stop all activities and take corrective actions. 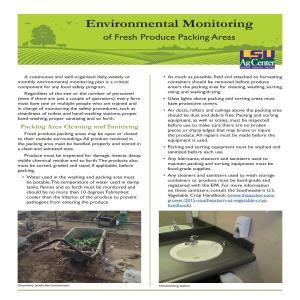 Evaluations of potential food safety risks are some of the most important procedures fruit and vegetable growers can undertake to make sure they are ready for harvesting. 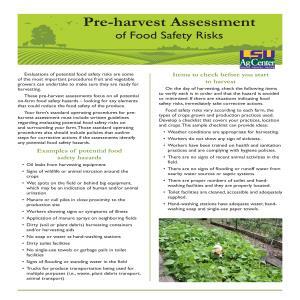 These pre-harvest assessments focus on all potential on-farm food safety hazards – looking for any elements that could reduce the food safety of the produce. 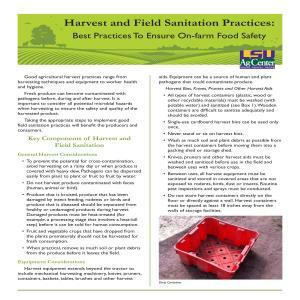 Your farm’s standard operating procedures for pre-harvest assessment must include written guidelines regarding evaluating potential food safety risks on and surrounding your farm. Those standard operating procedures also should include policies that outline steps for corrective actions if the assessments identify any potential food safety hazards. Moving fresh produce between the point of origin and point of use requires multiple transportation steps. 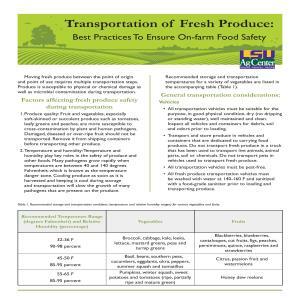 Produce is susceptible to physical or chemical damage as well as microbial contamination during transportation. 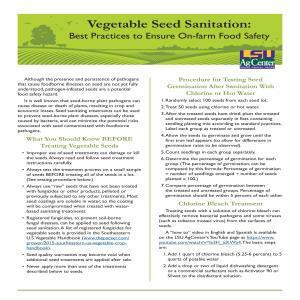 Although the presence and persistence of pathogens that cause foodborne illnesses on seed are not yet fully understood, pathogen-infested seeds are a potential food safety hazard. It is well known that seed-borne plant pathogens can cause disease or death of plants, resulting in crop and economic losses. Seed sanitizing treatments can be used to prevent seed-borne plant diseases, especially those caused by bacteria, and can minimize the potential risks associated with seed contaminated with foodborne pathogens. Washing fresh produce with potable water treated with a sanitizing agent can reduce microorganisms and pathogens that may be on the surfaced of the produce. These potential problems include post-harvest rot and decay microorganisms such as spoliage bacteria and yeast, Botrytis, penicillium and mucor as well as foodborne pathogens such as E.coli, cyclospora, Listeria, and salmonella. People who handle produce on farms and in packing houses influence the safety of fruits and vegetables. The produce safety rule from the U.S. Food and Drug Administration’s Food Safety Modernization Act identified farm workers as one of the important routes of pathogen contamination. 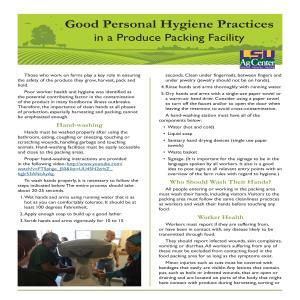 Worker health and hygiene practices throughout all phases of production are critical to minimizing the contamination of produce or areas that come into contact with produce with harmful microorganisms. Many growers already are following good agricultural practices and good handling practices, but some of them fall short when it comes to documenting their activities. 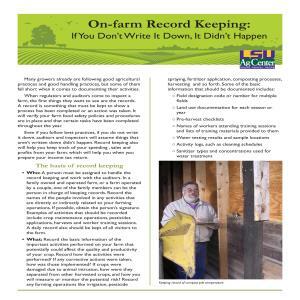 When regulators and auditors come to inspect a farm, the first things they want to see are the records. A record is something that must be kept to show a process has been completed or an action was taken. It will verify your farm food safety policies and procedures are in place and that certain tasks have been completed throughout the year. Even if you follow best practices, if you do not write it down, auditors and inspectors will assume things that aren’t written down didn’t happen. Record keeping also will help you keep track of your spending , sales and profits from your farm, which will help you when you prepare your income tax return. For more information, click the PDF at the bottom of the page.